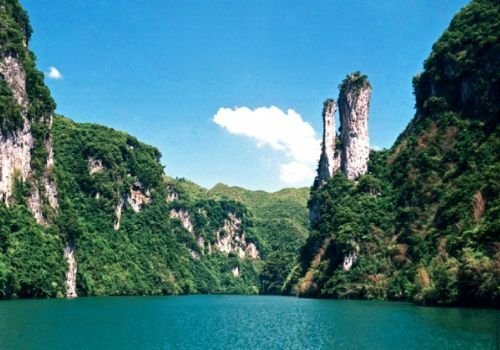 Like many other beautiful regions in China that have been formed as a result of continental upheaval and subsequent glaciation/ erosion, leaving mountains, rivers and lakes, Wuyang River Scenic Area is marked by just such continental upheaval and glaciation that has left behind a breathtakingly beautiful trail of mountains, deep gorges, rivers, lakes and waterfalls, as well as grotesquely shaped cliff faces and odd rock formations. 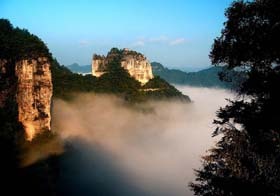 Wuyang River Scenic Area comprises Mount Yuntai (yún tái shān 云台山), Feiyun Cliff (fēi yún yá 飞云崖), Tiexi River (tiě xī 铁溪) Valley and Ancient Walkway, Qinglong Cave (qīng lóng dòng 青龙洞), and Wuyang Three Gorges (wǔ yáng sān xiá 舞阳三峡), which consists of Long Wang Gorge (lóng wáng xiá 龙王峡), East Gorge (dōng xiá 东峡) , and West Gorge (xī xiá 西峡). Mount Yuntai is located about 15 kilometers north of the town of Shibing. It is characterized by high peaks, steep cliffs, and caves adorned with stalactites and stalagmites. The area around Mount Yuntai is a typical karst landscape, i.e., the bedrock is of carbonate origin, either limestone or dolomite, that erodes unpredictably, leaving pitted stones, some above ground and some in the form of sinkholes, and some of which "pitting" results in caves of varying sizes. Temples, pavilions and remnants of other ancient structures, including stone walls and gates with inscriptions carved upon them dating from the Ming (CE 1368-1644) Dynasty, can be found here, surrounded by dense forest cover. The region is a melting pot of Taoist, Confucianist, and Buddhist beliefs. Feiyun ("Flying Cloud") Cliff is located at the foot of Mount Dongpo (dōng pō shān 东坡山), roughly 12 kilometers east of the town of Huangping. The cliff itself is highly irregularly shaped (in the form of a cloud, whence the nickname), if not grotesquely pitted, the result no doubt of glaciation and aeons of subsequent erosion. A temple with adjoining pavilions, corridors and archways was built here, the original buildings dating from the Ming Dynasty, as indicated. Because the temple lay on a key route in ancient times, it also served as an inn for passing government officials, artists and scholars, many of whom left inscriptions here as testimony to their visit. The Guizhou Museum of Ethnic Fesitvals, which is the venue for many ethnic festivals in Guizhou Province each year, is located at Feiyun Cliff. There are also permanent displays of ethnic costumes, artworks, musical instruments, articles of worship and various household implements and utensils at the museum. 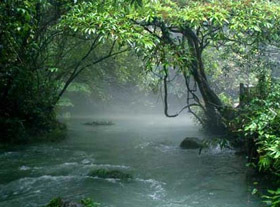 The Tiexi is a small freestone river that is a tributary to the Wuyang River. It lies in a majestic valley richly adorned with vegetation and boulders, some of the latter of which are grotesquely shaped, as are so many other rock formations in this karst landscape. 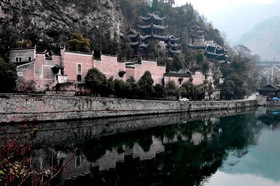 An ancient walkway, about a 20-minute drive from the town of Zhenyuan, is located along the stream - and crosses it in places. The 3½ hour tour by foot along the ancient walkway offers some spectacular views of the valley floor and the surrounding valley walls, often also grotesquely shaped. The walkway passes a mystical pool of unknown depth called the Dragon Pool that covers about 500 square meters and whose waters, though not specifically fed by hot springs, is warmer than the air, with the result that Dragon Pool is generally enshrouded in a blue-green mist. Transportation: take tourist bus, CNY 7 per person. Qinglong ("Black Dragon") Cave is a large complex of temple buildings, some of which are anchored onto the cave-like (concave) cliff faces of Zhonghe Mountain, somewhat reminiscent of the City of Petra in the Indiana Jones film, Indiana Jones and the Last Crusade (which city, in contrast, was carved out of the sandstone cliffs of the labyrinthine canyon in Jordan where the uforgettable scene of the pursuit of the Holy Grail – a chalice in this case – took place). 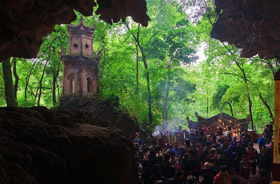 Black Dragon Cave comprises Zhongyuan Temple (zhōng yuán chán yuàn 中元禅院), Yuhuang Pavilion (yù yuán gé 玉元阁), Zhusheng Bridge (zhù shèng qiáo 祝圣桥), Ziyang Shuyuan (zǐ yáng shū yuàn 紫阳书院), and Xianglu Palace (xiāng lú yán 香炉岩). Apart from the uniqueness of the manner in which a number of the temple buildings are attached to the cliff faces, which has resulted in a decidedly facade-like aspect of verticality, the architectural style of Black Dragon Cave is simple and austere, blending in with the surrounding landscape in perfect, aesthetic harmony. Black Dragon Cave was granted protection as a key cultural site by the Chinese government in 1988. 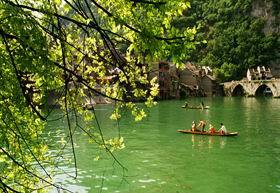 Wuyang Three Gorges refers to three time-worn old gorges along the Wuyang River in the southeastern part of Guizhou Province. They constitute the primary natural sightseeing attractions of Wuyang River Scenic Area, and are home to strange, secluded caves, springs that bubble up from the karst bedrock below, stunningly beautiful waterfalls in various dimensions (though they tend to be of the short rather than the tall variety, and narrow rather than broad), and grotesque cliffs barren of vegetation that alternate with steep tree-and-shrub-covered valley walls that narrow and broaden as the river twists and turns along the valley floor. A trip through these beautiful gorges is a mystical experience in itself, and reveals perhaps why so many religious sects from China's ancient past - from Taoists to Confucianists to Buddhists - chose to build monasteries and temples in this spectacularly beautiful setting, so conducive to meditation. Transportation: You can take a train from Guiyang and get off at Zhenyuan County, which will take you a whopping 5 hours - but a 5-hour train ride that will take you through some of the most beautiful natural scenery that you are likely ever to see. 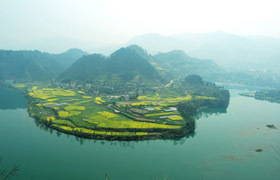 If you start from the city of Kaili, the capital of the prefecture, it will only take 2 hours to reach Zhenyuan County. Tips: There are regular buses to the Wuyang Draft Ferry, from where you can take a small ferry boat (it can carry only 4 passengers) on to the city of Zhenyuan. The fare costs 40 yuan per person and lasts roughly an hour.